As I suspected would be the case, ID Challenge #11 has proven to be an especially difficult challenge. As a result, instead of posting the answer tonight I’m going to give folks another day to make their play for points (remember, nobody walks away empty-handed). In the meantime, I’ve had a chance to ruminate over this past weekend’s BugShot insect photography workshop at Shaw Nature Reserve in Gray Summit, Missouri, and now seems to be an appropriate time to post some final thoughts while they’re still fresh in my mind. Suffice it to say that it was an incredible experience—both technically and socially. I learned far more than I thought possible (and hope I can remember even a portion of it) and made some great friends in the process. It’s really not possible for me to summarize here all of the techniques, insights, equipment choices, etc. that were covered, nor do I want to—such a list would be boring to read and not very meaningful without the context to go with it. What I would like to do is shout out a few people who, beyond the collective, helped make the weekend what it was for me. Instructors. The three instructors, all accomplished insect photographers of the highest caliber, typified three very different yet complimentary approaches to the art. Alex Wild (University of Illinois), ant photographer extraordinaire and author of the insect blog I’ve most tried to emulate, gave me tremendous insight on lighting and practical approaches on how to use it effectively. My discussions with John Abbott (University of Texas) about equipment will be very helpful for the type of photography that I like to do (I’m not sure I’m ready for the tripod yet, but maybe the other ideas we discussed will be the “slippery slope”). Finally, I thoroughly enjoyed my time with Thomas Shahan (Norman, Oklahoma), whose great artistic insight helped me see a whole new world of possibilities for tiger beetle portraiture. I must admit to feeling a little star-struck when I first began talking to him, but his infectious enthusiasm and exuberance quickly put me at ease. Friends. I can’t begin to list everybody whose company I enjoyed, but standouts include Jo Holly (Alex’s better half! ), as well as fellow bloggers Crystal, Lee, Dave, and DragonflyWoman. Even though I only met them this weekend, it was if I had known them for years. My time “fishing” tiger beetle larvae with Crystal and Lee was not only a highlight of the trip (watching them “jump” as the larva came flying up and out of the burrow was a real treat), but also represented a discovery in the truest sense of the word (as will become clear in a future post). No discussion of friends would be complete without mentioning James Trager, not only for opening up Shaw Nature Reserve to this weekend’s event, but also for the access he’s given me over the past several years and our frequent, humorous email discussions about all things entomological (or botanical, ecological, etc.). Gratitudes. I want to thank Alex for inviting me to take part in this event as something more than just an attendee. I hope my contribution, however small, was beneficial. My thanks also to Patsy Hodge, who was so helpful and gracious to me in the days leading up to and during the event. I also appreciate the kind comments that many of the attendees made to me about my blog and my photographs—your encouragement means a lot to me. Regrets. In an event like this, packed as it was with seminars and group discussions, it is sad but unavoidable that one cannot spend at least a little time with each and every person in attendance. To those that I did have a chance to talk to, the pleasure was all mine. To those that I missed, I will catch you next time! I think I’ll close with this minimally processed photograph of what I take to be Misumenoides formosipes (whitebanded crab spider) and its honey bee (Apis mellifera) prey. Although I photographed this spider using flash and looking straight up into an overcast sky, I managed to properly illuminate the subject and avoid blown yellows and an all-black background by using some of the very techniques and principles that I had just learned earlier that day. I hope to learn more at BugShot 2012! 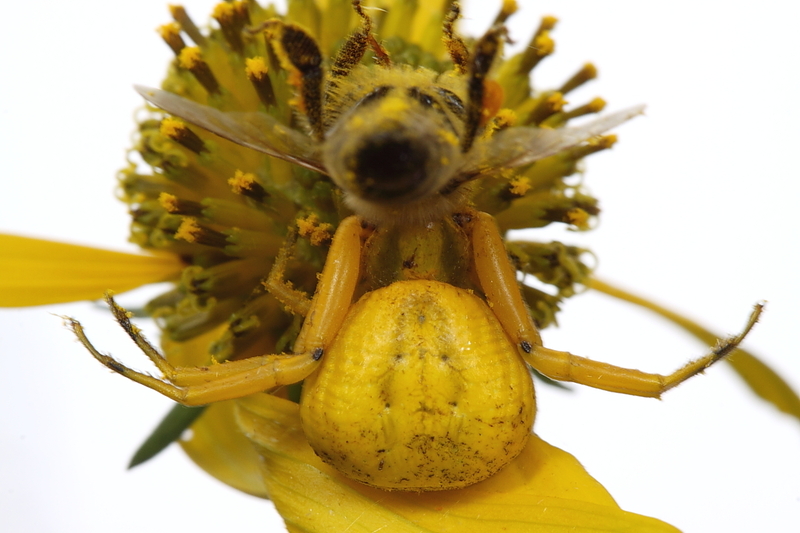 This entry was posted in Apidae, Arachnida, Araneae, Hymenoptera and tagged arachnids, bees, BugShot, insects, lighting, photography, science, spiders, techniques. Bookmark the permalink. As usual, you’ve said it better and with more sincerity than the rest of us can, Ted. What a blast! Thanks so much for putting the thoughts so many of us have into such an eloquently presented blog entry! Thanks for sharing your experience and expertise with us Ted! Sure thing – maybe you can take part next year. Well, I don’t know about humorous, but at least, good-humored. In any case, I think it fair to say a good time was had by all!